The various types of eyeliners are pencils, gel / cream, and liquid. All three are capable of different styles, have different ways of applying, as well as different skill levels needed to properly apply them. My personal favorite is gel and liquid due to their precision and the detailed looks I can achieve with them. Hi everyone! This video is going to be about the different kinds of eyeliners. The three I will be discussing are pencil, gel, and liquid. All three are capable of different styles, have different ways of applying, as well as different skill levels needed to properly apply them. My personal favorite is gel and liquid. I find that pencils do not achieve the look I am going for so gel and liquid do a much better job at that. Pencil eyeliner is probably the easiest to use so it is great for beginners. The two I am showing here are a straight up pencil that would need to be sharpened and the other one you twist and does not need to be sharpened. The difference between these two are that the actual pencil would get duller if not sharpened regularly. And that is one con of pencils, that it can get dull and lose its point. Another con, and this depends on the look you are going for, is that you cannot get the sharpest line with a pencil. If the pencil is sharpened, you can get a pretty good line, but overall it will not be as sharp or dark as gel or liquid. Pencils also smudge the easiest. So again, depending on the look you are going for, this can be a pro or a con. 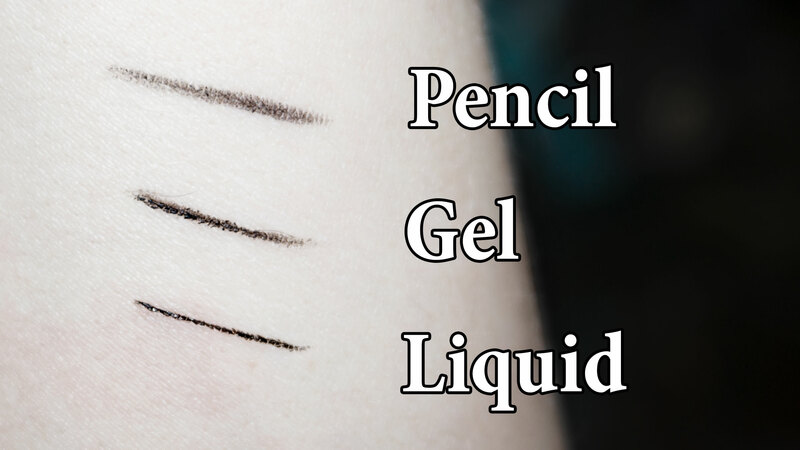 Gel eyeliner is different from the pencil in that you need a brush to apply it. So like a pencil, the line may not be as sharp if you do not use the appropriate tools. Gel eyeliners are almost in between pencil and liquid eyeliners. The texture is creamy, not too solid or runny. However, due to the texture, it can clump up on the brush. For someone new to makeup, this will generally be easier than liquid, but harder than pencils. A good feature of gel eyeliners is that they tend to have the longest staying power of the three. It can stay on so well that it can sometimes be difficult to actually get off. Additionally, you can use it as eyeshadow, or to darken up your eyeshadow. While it may not smudge as easily as pencils, you can apply it to where you want the eyeshadow the darkest and then use some shadow over it to blend it out. And finally, liquid eyeliner is probably the most difficult to master since you have to have a steady hand and be careful not to let it smudge or run down. However, it can create the sharpest line and is best suited for dramatic, detailed looks. The first one I am showing you dip into the container with liquid and the brush comes to a point allowing you to make a rather precise line. While the other is a pen and all you need to do is shake it. While the pen is more convenient, the problem with most liquid eyeliners in this form is that it will dry rather quickly and get some buildup of powder, eyeshadow, and whatever other makeup you are wearing on your face on the tip which can result in the line looking faded and needing to reapply it multiple times in the area. This causes a problem since liquid eyeliner tends to, not fade like pencil or gel eyeliner, but rather it may peel or smudge off. You may have pieces of your line missing due to the peeling. Here is a comparison of all three. Depending on the look you are going for, you can choose the one that is appropriate for you. I personally like a thinner, precise, line and I feel only liquid and gel can give me that. As for what is best to use for the waterline. Well, I personally never put makeup on my waterline since it tends to irritate my eyes. But if you are going to use one, pencil will probably be the best, followed by perhaps gel. Don’t try to put liquid on your waterline since it will not dry and get into your eyes and irritate it. As for other kinds of eyeliners, eyeshadow can substitute. However, this is mostly a last resort since eyeshadow will most likely not be able to be as pigmented as a real eyeliner. The precision is low, less than that of a sharpened eyeliner pencil. And it can fade rather quickly. Feel free to let me know what types of eyeliner is your favorite. Do you prefer pencil, gel, liquid and why? Let me know. I hope this video was informative and helpful. Thanks for watching! I started out using pencil eyeliner and was not very good as I jabbed my eye a few times. I never wanted to do makeup again. Yet, I kept trying and started using gel and liquid eyeliners and it was amazing how my skill improved. Depending on the look, gel are liquid eyeliners tend to be the ones that I use as I find it create the best line. If I am doing a less dramatic and sharp look, I will use pencil which makes it look more blended.